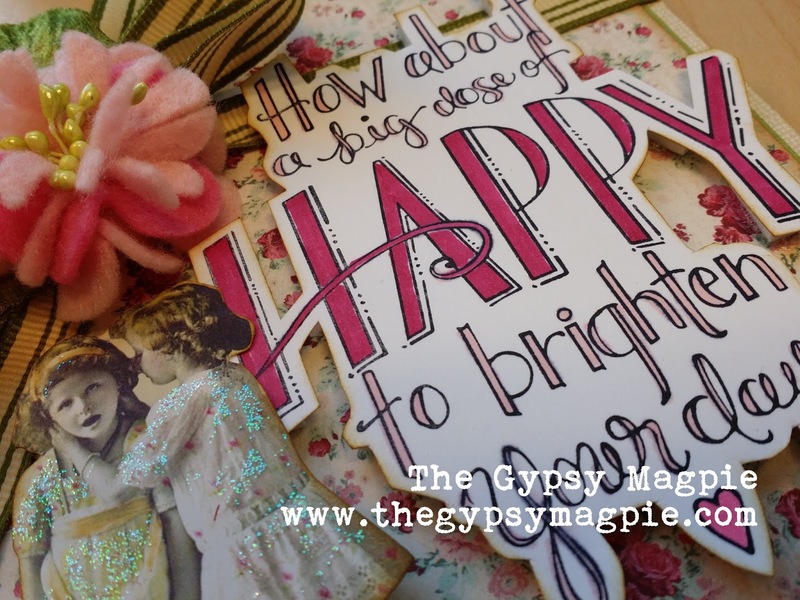 One can never have too much happy, right? This card made me pretty happy when I was putting it together. Don't you just LOVE this stamp??? I'm crazy over it! Between the quote and Tammy Tutterow's gorgeous writing, I'm totally smitten. I want to stamp it on everything. It was easy to fussy cut around the stamped image, giving a little dimension as I layered it on top of the striped ribbon. 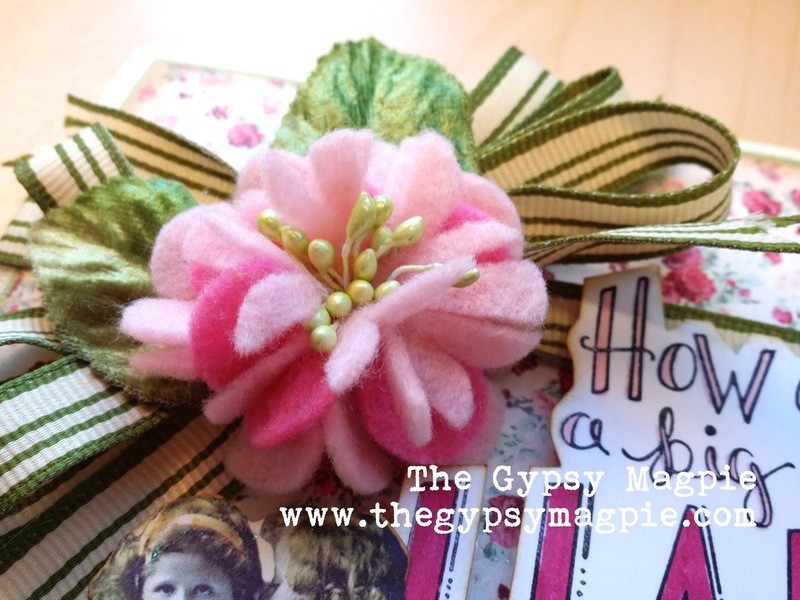 The fluffy flower began with the darling Floweret Posies die and some felt. I wish I'd had some wonderful wool felt to use- and the crazy thing is I have a huge stack somewhere- but since I couldn't find it I had to use el-cheapo synthetic felt from the craft store. Surprise! It actually worked just fine. I used two colors, cut multiple layers and snipped into the top flower so that it would kind of fringe itself around the stamens. With a quick whip-stitch to hold the entire thing together I was done in a flash. Boom! Perfect accent. How is that for a big dose of happy? It worked for me! Well it sure works for me! This card is just brimming over with all kinds of happy! I love that felt flower sooooo much! I also love the way you fussy cut around the stamped sentiment. Just wonderful in every little detail! what a sweet card! Where did you get those vintage girls? I love using vintage images as well. 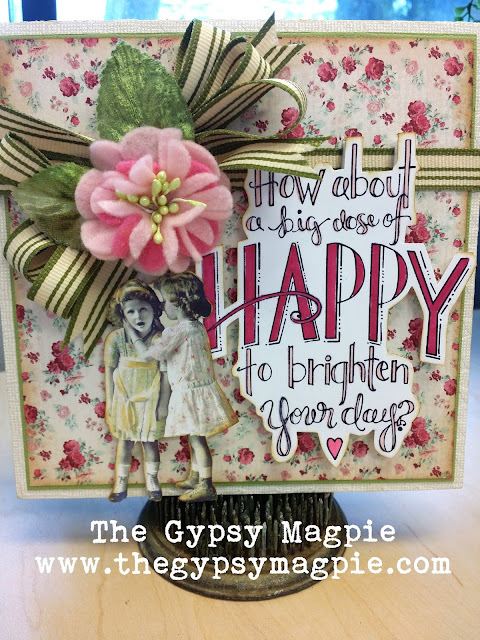 Your card is amazing and the I'm swooning over the gorgeous flower you created, Terri! This is so sweet.